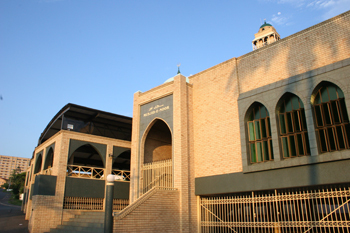 This musjid is situated in the heart of the Durban Muslim community. Initially it was established a Jamaat Khana and nursery school below but it was later changed into a Musjid. 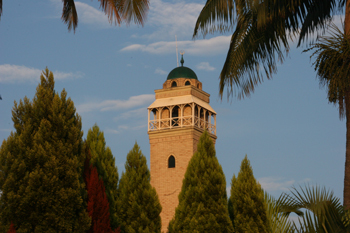 The five daily salaat jamaat are performed here including Jumu’ah salaat. Hazrat Maulana Yunus Patel is the Imam and Khateeb of this musjid. Hazrat Maulana from inception has taken on the responsibility of Imaamat of the Musjid totally for the Pleasure of Allah Ta’ala and without salary fulfills this duty. Hazrat Maulana neither derives any income from his Imaamat duties, the Madressah, counseling, nor from the sale of tapes, cd’s,etc. It is due to this sincere intent of Hazrat Maulana that Allah Ta’ala has blessed Hazrat with great acceptance in the work of deen and placed such an immense effect in Hazrat’s programmes (writer comments). Hazrat has a weekly Majlis programme on Monday nights which is a 45minute lecture programme dealing with different subjects, the theme being Islah (self reformation). Provision for ladies is made at Madressatus Sawlehaat. On Thursday a Zikr programme is held which is a 45minute programme, the theme being Taubah (sincere repentance). Provision for the ladies are also made at Madrassatus Sawlehaat. Hazrath Maulana also conducts most of the Jumu’ah programmes at Musjid-e-Noor which entails a 20 minute advice in english dealing with current issues followed by the Khutbah Arabic. Hazrath’s whole aim and objective of having these types of programmes is to connect people with Allah Ta’ala.